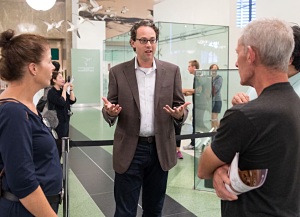 Eric Einhorn, General & Artistic Director of On Site Opera, describing the site-specific production model to audience members. What we put “on stage” (as it were) is the heart of our work at On Site Opera. It is also important to us as an organization and as opera professionals to stay connected to the opera field at large. I’m extremely proud that On Site had a veritable entourage attending this year’s National Opera Conference in St. Louis in June. This year I attended with our Executive Director, Piper Gunnarson, and two of our board members, Jane Gross and Corey Kinger. As always, the conference was a fantastic opportunity to connect with peer opera companies, which lead to the start of new partnerships and co-productions that we will pursue over the next 1-3 years. I was honored to be asked to speak on two panels at this year’s conference: Producing in Alternative Spaces during which I shared the nuts and bolts of our site-specific production model, and a crucial all-conference session on Confronting Sexual Harassment. The four energizing days in St. Louis served as a confirmation of the strong place that On Site Opera has in the opera world, both artistically and organizationally. Thank you for being a part of our journey!